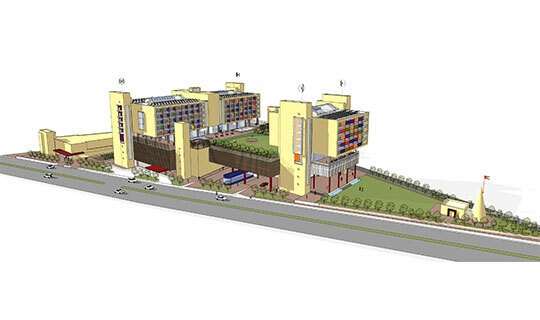 Plot area : 23,180 Sq mt. Built up area : 29,591 Sq mt. Carpet Area : 20,713 Sq mt. The Gujarati Bandhu Samaj is an ardent promoter of Gujarati culture, its initiatives facilitate the organization of traditional events and community gatherings, while providing a platform for social interaction to students and the Gujarati community residing in Pune. 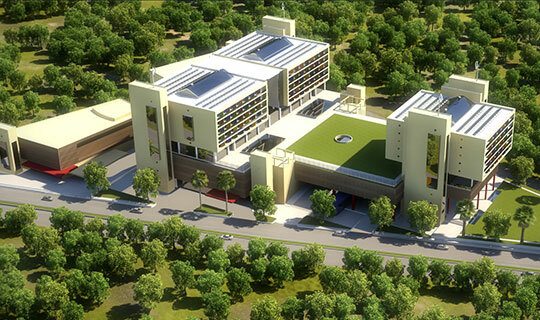 Designed to sit on a 5.7 acre triangular plot in the Bibewadi suburb of Pune, the Gujarat Bhawan was conceived as an encapsulation of the Gujarati lifestyle and culture in a single unified campus. 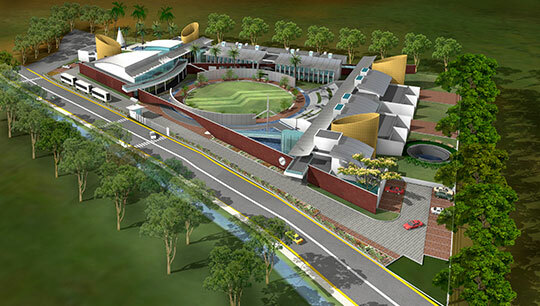 Commissioned through an invited competition by the Gujarati Bandhu Samaj in 2010, the campus would consolidate the varied functions of education, culture, accommodation, dining and recreation; while representing Gujarat and its vibrant ethos through contemporary architecture and bright, airy interiors. 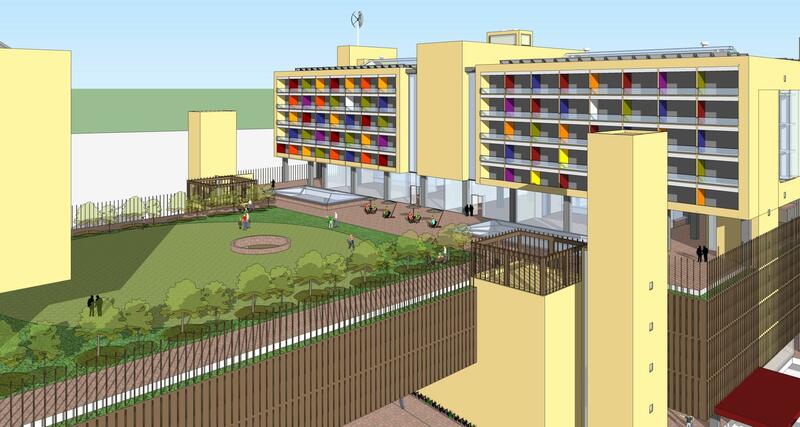 The varied functional zones are massed into two blocks, one accommodating the educational and residential facilities; while cultural and community activities are housed in the other. 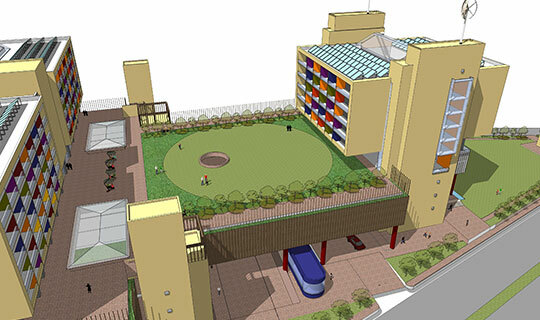 Segregated pedestrian and vehicular circulation patterns allow Independent access for the two buildings, apportioning the site into smaller wedges on the ground level. 3 basement levels provide essential parking space. 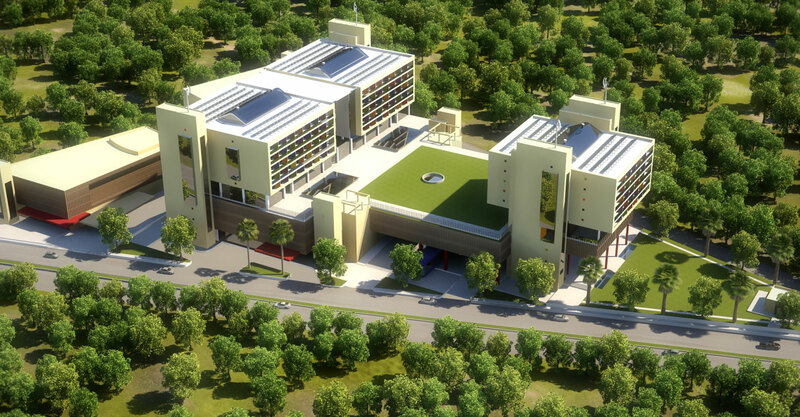 The educational building is planned to the South-West of the site, its lower ground floor incorporating a library, conference rooms and administrative offices, along with waiting lounges and meeting rooms.The upper three floors are composed of classrooms arranged at the periphery of the block, cashing in on working daylight, thereby reducing the building’s electrical load by a considerable level.Two central atriums flank an internal amphitheater on the upper ground floor; partitioned by suspended labs on subsequent levels. 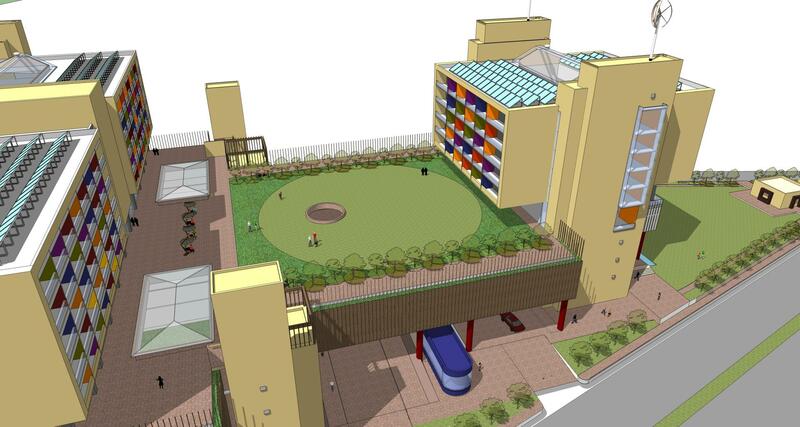 The third floor turns into a recreational level, accommodating sports facilities, dining and kitchen areas; and bridging across the block over into the community building through an elevated outdoor grassy court. 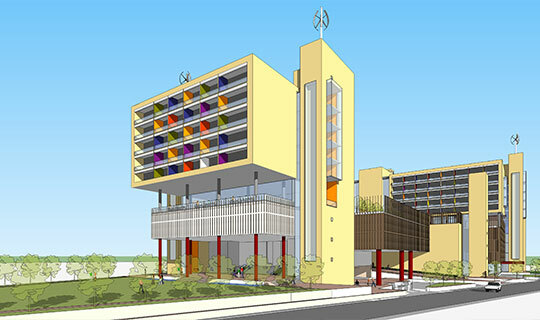 Upward from the third floor and extending till the eighth, lies the residential wing for boarding students, with 4-bedded dormitories at the peripheries, along with utilities, toilets and reading cells located centrally, together enclosing two cut-outs illuminating the entire circulation space from the skylights above. 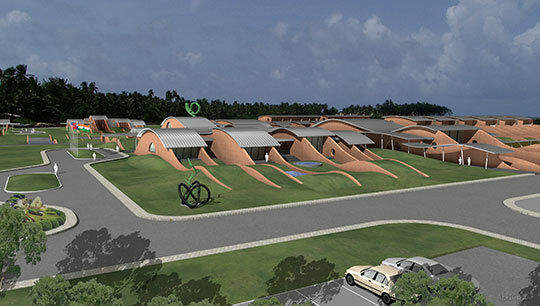 The community building, accessed by a straight road cutting through two sides of the plot, houses a double height waiting lobby on its lower ground level, opening out to a multi-purpose party lawn toward the North, with a temple marking the furthest vertex of the wedge-shaped site. Above, a community hall stands on stilts, inching toward the educational building, as it shelters the entry porch. 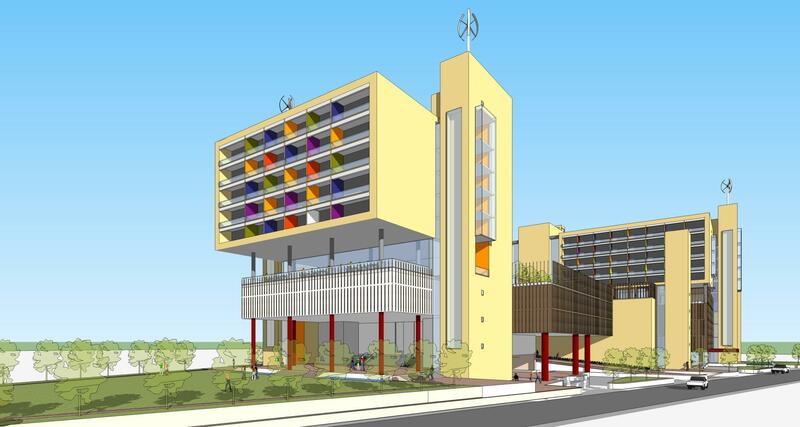 The first floor accommodates a dining hall, pre-function lobbies and multi-purpose halls, as it unites with the college block, supporting its academic activities with community spaces. 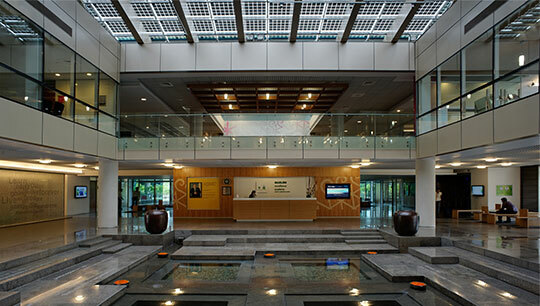 The second floor, aligned with the recreational level, incorporates a dining hall and kitchen. Above this level lie 5 floors of guest accommodation, with standard rooms, suites and a TV room enclosing a landscaped court, illuminated by a skylight on the terrace. 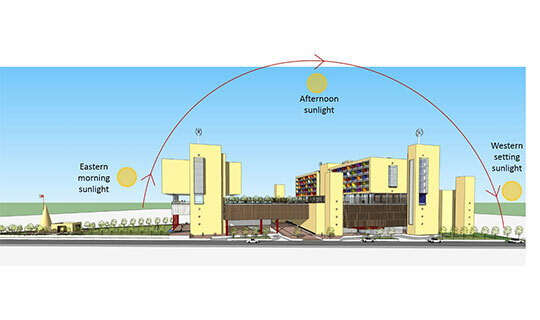 The building orientation helps avoid direct sunlight from the east and west, while facilitating easy vehicular access along two sides of the angular plot. 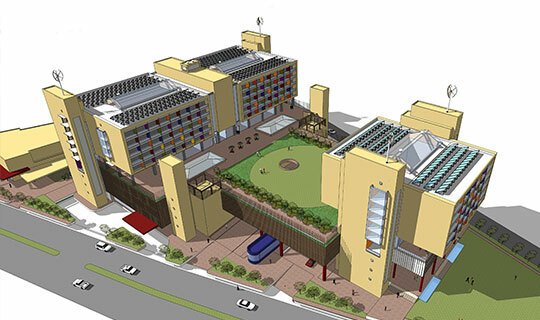 The interconnected built mass assumes a large footprint, allowing a consolidated basement space accommodating the building’s parking requirement.The design solution proposes alternate sources of renewable energy like wind turbines and solar panels, providing adequate infrastructure on the terrace levels. The entire structure is planned on a modular grid of 8.4mx8.4m, its inherent horizontality facilitating easy access to the public gathering space on the ground level. 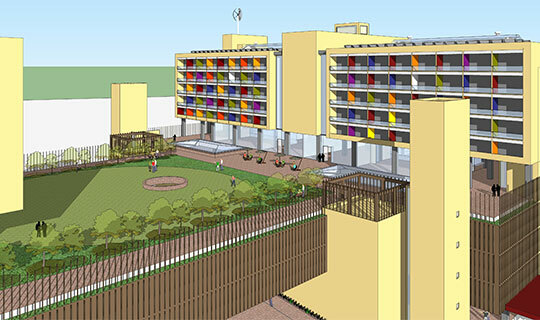 The elevated garden successfully reclaims a major portion of the displaced landscape, creating a shared green zone linking various activities on the campus. Vegetation on the periphery of plot, in the open space as well as roof top garden helps minimize heat absorption through built forms, apart from tempering the microclimate of the inhabitable spaces by evapotranspiration. Rain water harvesting and recycling of grey water are proposed as a conscious water conservation strategy. 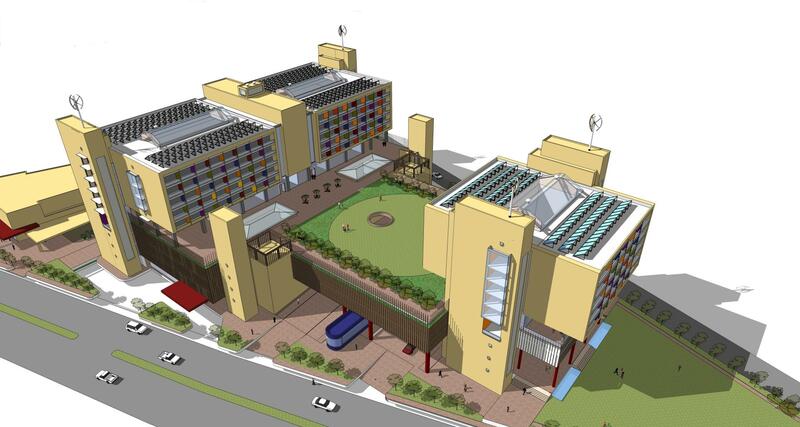 Green technologies and sustainable design principles not only ensure environment sensitive development, but also allow the project to be self-sufficient in its energy demands. A play of volumes in the interior allows a myriad of spatial experiences across the premises. Barrier free access to the different zones through ramps, ensures a universal design. 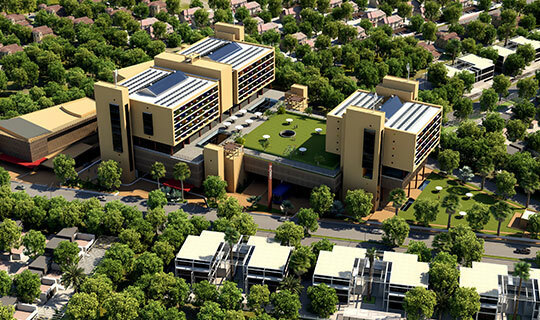 Keeping its spaces and amenities in sync with Gujarati traditions, the Bhawan provides an integrated facility for the Gujaratis living away from their sate, to participate in social gatherings, charity events, theatre, dance, arts and festivals associated with their culture. 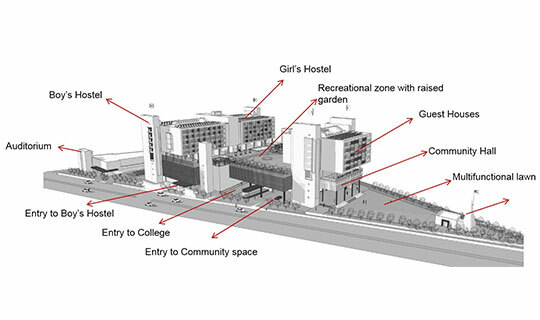 Introverted planning, openings and interconnections between the various zones, consolidate the campus into an urban utopia, resonating with the identity and lifestyle of the people of Gujarat.